Cold, one of the most annoying things. During the winter everybody is freezing and being outside is just a pain. Throwing snowballs is fine, but not longer than an hour, and please don’t put ice inside my jacket. When you get in contact with very cold water, ice or snow, most of the time you react/reflex out of fear. Most of us adore heat, but fear cold. I thought this is just a perception. What if we could indulge the sense of cold and change this perception? When we face the cold, our body is subjected to external sense. On our skin and within our body we have receptors that sense cold temperatures and send this information to the hypothalamus, an area in the brain. In response the hypothalamus regulates the heart rate, veins to constrict or dilate, and (indirectly) releases hormones like adrenaline and thyroxin. In the Western view this is seen as an automatic process, we are subjected to our body. When our bodies are cold we cannot consciously warm it up by activating our hypothalamus from within. Whenever we are ill, have pain, or are just freezing, we feel like we have no control over our body. In some Eastern (Buddhist) views this is different. “Tummo” is a practice of breathing and visualization which is Tibetan for “Inner fire”. With this practice you teach yourself to feel warm within. Buddhist monks who practiced Tummo for years were able to warm up the skin temperature of their fingers and toes by 8,3 degrees Celsius. Just by meditating, these monks were able to dry wet towels on their body in a cold room within an hour. The “Iceman” (Wim Hof) also practices Tummo for his world record exposures to the cold. This is a very impressive skill. However, practicing Tummo requires a lot of training. I figured I could try to change my perception about the cold just whenever I was facing it. What if I just try to change my perception of the cold? Will I be able to do this and will my body adapt to it? So what did I do? On the 22th of October 2015, I decided it was my last day to wear a coat. Just not wearing my coat was my original plan, nothing more than that. I live in the Netherlands so in October the autumn is flowing in. From October on, the weather will gradually get colder. Clothes Not wearing my coat was my original plan. But that wasn’t that much of a challenge. So I added a challenge, just wearing a short sleeved shirt was the maximum I could wear for my upper body. I was also figuring to wear shorts or not. Whenever I wore shorts I got so many weird stares, that I didn’t really enjoy it. Also, in my opinion, it doesn’t really look professional so I decided just to wear jeans. However, whenever I went exercising (outside) I did wear shorts. Heating Usually I don’t turn up the heat often in my apartment. However, during this experiment I consciously did not turn up the heating whenever I was alone. I am not forcing my friends to be cold so I turned on the heat when my friends asked me to. This only happened once this measurement period. On working days (Mon-Fri 9-5) I am subjected to other parties who are in control of the heating. They all wear sweaters but still like to crank up the heat. I measured the physiological effects using my Basis B1 watch. The Basis B1 watch measures my heart rate and skin temperature 24/7. It took the daily average of each day (a 24 hour measure) as the measure per day. I analyzed a period of 411 days, within this period I am missing 160 days of data. My Basis B1 does not always sync correctly or does not measure data once in a while, which resulted in less data. A considerate amount of the missing data is data from during the holidays. Next to this, I always measure a lot of psychological variables. Every day I rate several psychological variables on a scale (1-10). I will describe some relevant variables. Also I will give a qualitative analysis, because this is quite meaningful in my opinion. I will separate my results in two categories, psychological and physiological effects. The Netherlands has a temperate climate with mild winters, cool summers and precipitation throughout the year. So we would expect that there are seasonal effects on my skin temperature and heart rate. 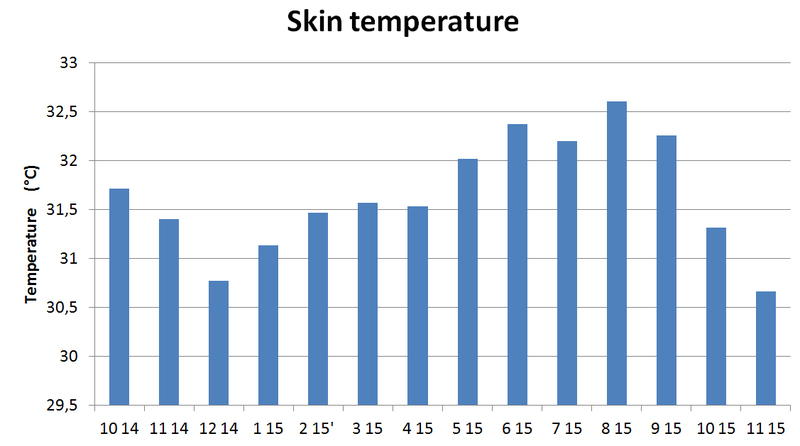 I found a relation (Ƭ=0,575 p=0,004) between weather temperature and skin temperature. Heart rate showed no relation with weather temperature or skin temperature. I graphed the monthly averages over the years to have more understanding of the fluctuations of my heart rate, skin temperature, and weather temperature. Weather- and skin temperature is lowest in the winter, and in the summer the highest. For unknown reasons, my heart rate shows a different seasonal pattern. November 2015 is the month where I faced the cold. The last bar is the graph is this month. In this month I reached my lowest skin temperature and heart rate ever. From the 22th of October 2015 I faced the cold and I did analyses until the 27th November. I compared this period with the same “Normal” period in 2014. Where I wore whatever I wanted and didn’t face the cold. I did not record what I wore in 2014, but usually I wore a jacket when I went outside and also sweaters. 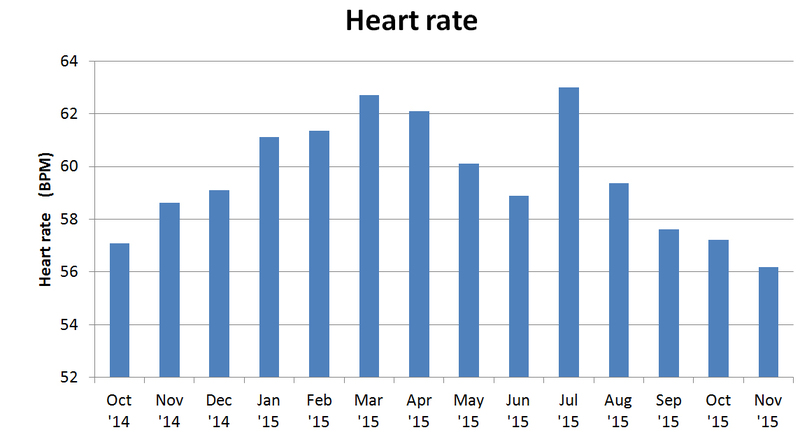 This year my skin temperature and heart rate were significantly lower, 0,76 °C and 1,5 beats per minute (BPM) respectively. 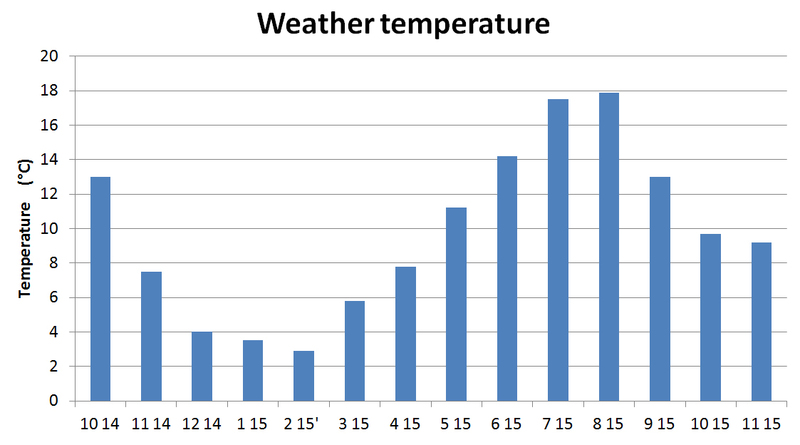 Weather temperature was this year higher, but not significantly different. I found myself to have a relative dry skin in November 2015. I didn’t measure this, but I noticed this during the measurement period. Comparing “the normal period” in 2014 with “facing the Cold period” in 2015 I found several results doing a T-test. In November 2015 I was significantly happier (1,1 point) more active (1 point) more healthy (0,7 points), and less lonely (3 points). These are pretty strong differences but these may have other causes. November 2014 was fairly different for me than 2015 was. Therefore a qualitative analysis is more suitable here. Challenge The most important effect for me was that my perception of the cold did change. At 22 October my only plan was to not wear a jacket anymore. However, I started to the cold as a challenge. I didn’t see cold as an uncomfortable feeling anymore, it became a challenge. I wanted to see what I could do. So I added some challenges, such as: only wearing a t-shirt, not turning up de heating, take a cold shower, do ice baths with my hands. These challenges started to become fun for me. Every day towards the winter is getting colder so the challenge to face the cold is increasing every day. Social responses I got a lot of social responses from friends and strangers. People thought that I was crazy or were very curious. I have to be honest that I enjoyed those reactions. Social response is definitely not the reason for me to keep doing it. However, it did encourage my drift and it also increased my knowledge when people shared their experiences. Shivering I told myself to stop shivering whenever I felt a little cold. Shivering is in my opinion a useless way to generate heat. Whenever I had the eager or to start shivering I consciously told myself to not do it. I managed to do this and almost never shivered anymore. With psychological influences I changed automatic physiological activities. I managed to influence my perception of cold temperatures. I don’t see cold as physical pain anymore and I experience cold way less than the people around me do. I started to see the cold as a challenge and I have been enjoying it. However, physical results showed that “Facing the cold” still influences my body; my skin temperature and heart rate are considerable lower than in normal situations. Over the cold period my veins in my skin were constricting. This led to a lower skin temperature. Next to this, it probably also caused my drier skin. Less bloodflow to my skin means less surface for my blood to pump around. Therefore my heart rate probably decreased over this period. This is exactly as my body should act when facing the cold. My body still perceives the outside temperature as cold. When we take our psychological, and physical results together, we can conclude that “facing the cold” changed me mentally but not physically. My perception has changed, but by body didn’t. For several cold situations this is very beneficial, I have less problems with facing the cold when going out of bed, during the day I am never freezing, and never have hurting cold fingers. However, in extreme circumstances this desynchronization between physical- and mental cold could have severe consequences. My fingers do become cold, but they just don’t hurt. One could argue that I could become hypothermic and have dying fingers without noticing it. Therefore, I need to be aware of this. There are several factors I would like to discuss concerning this experiment. The first one is “Cold-induced vasodilatation”. The second one is illness. The last one is acclimatization. When you are facing cold temperatures, the first physical reaction of your body is to constrict your veins from your extremities to save your vital organs (your core). Your extremities (e.g. fingers) will become cold because there is less blood flow in them. This is where your fingers start to hurt. After 8-10 minutes CIVD takes place in normal people. CIVD is a protective function of our body. This means that the body opens the veins of your extremities again. As a result, your skin will become color bright red (like a red nose after exposing yourself to the cold for a while). After your extremities are warm enough, the veins will close again and this process will be repeated, unless your core is too cold. Than your body tries to save your vital organs by sacrificing your extremities. So in normal circumstances everyone’s body does this. You just have to go through eight minutes of relatively cold fingers. This can even be trained. In people who often face the cold (like professional fishermen) this reaction is even quicker. By the way, mental stress abolishes the CIVD, so if you ever are freezing, try to avoid stress. The first question most people ask me is; didn’t you get ill? And no, I didn’t get ill. I had a little cold in the beginning but I never got ill. I rated two constructs on a 1-10 scale, namely: “Having a cold” and “Feeling of healthiness”. In the next graph you can see my scores over the “facing the cold” period. Figure 4. 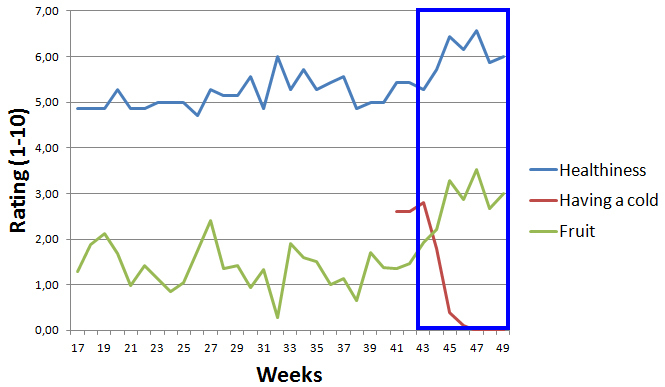 Perceived healthiness, having a cold, and fruit intake over months, Week 17 –49, 2015. Healthiness, and “having a cold” are 1-10 scales. Fruits are in pieces. Blue square indicates the period without a jacket. In the graph you can see that my feeling of healthiness was actually higher in the period of time where I did not wear a jacket. However, this could also be due to the increasing amount of fruit intake. For preventing illnesses I increased my fruit intake just to be sure (I know, bad scientific work, right?). There are two conditions for the spreading of infectious deceases, these are: cold temperature, and relative humidity of the air. Yes I am exposed to cold temperatures. However, dry air is the second condition. On average, colder air means a higher humidity rate. How higher the heating is cranked up, the drier the air becomes. So also in warm, dry circumstance you are prone to infectious deceases. However, research showed that cold temperature are more determining for the spreading of diseases. But you always have your own immune system to protect you. And as you can see in the last graph, I kept on feeling healthy during the “facing the cold” period, with an indication that my health is even increasing. Research showed that we as humans adapt less and less to our climate. We ignore our winters by wearing gloves, sweaters, cranking up the heaters whenever we feel a little cold. There is a theory that this can lead to higher susceptibility of infectious deceases. Animals have shown to have seasonal genes and/or intracellular pathways which influence the immune function. If we, as humans, ignore the seasons, these immune functions might work less properly. Therefore we would be more prone to the spreading deceases when we always keep everything around us at the same temperature. I feel like facing the cold is a challenge for me. I will go on with this experiment to find my limits. I am starting to have a raising interest in ice baths and more extreme cold situations. However, I should be aware of myself during these more extreme circumstances. Also I should do more experiments and measurements considering my blood pressure, core temperature, and possibly the temperature of my fingers. I will keep you updated.